If you thought you’d taken your last bite of truly authentic-tasting Chinese takeout when you gave up salt, think again. 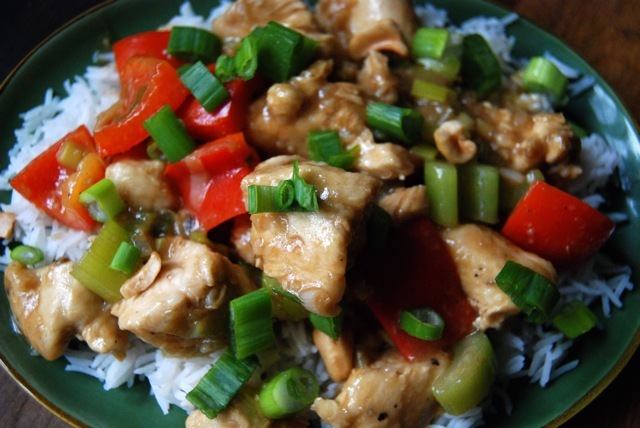 This Low Sodium Kung Pao Chicken isn’t just okay. It’s not meh, so-so, ho-hum. NO! It’s fan-freaking-tastic! Don’t believe me? TRY IT. The spicy bite of ginger, the tang of rice wine vinegar, the smokey depth of sesame oil, and YES – that certain indescribable SOMETHING that says I am Chinese takeout – it’s all there! I swear, if you put this in one of those white flap-top boxes, you’d never know the difference. I adapted this recipe from Fine Cooking, substituting Faux Soy Sauce for the verboten real-deal. If you’ve never used this Faux concoction before, just wait till you TASTE its marvelous effect!! On its own it won’t pass for soy sauce, though it shares the same deep dark look. But once added into a recipe it melds with the other flavors to produce the most remarkable fake-out ever! 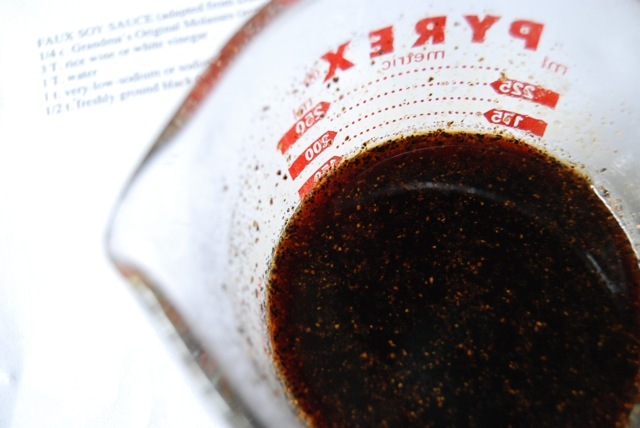 When making Faux Soy Sauce, look for the lowest-sodium molasses you can find. I use either Grandma’s Molasses or another I’ve found since moving to Maine called Crosby’s. Both are very low in sodium. If you can’t locate either, check labels carefully before purchase. The sodium-free beef bouillon granules are located alongside commercial bouillon cubes in the soup aisle of most supermarkets. Measure the chicken broth, 2 T. faux soy sauce, balsamic vinegar, 1 T. of the cornstarch, sesame oil and sugar into a small mixing bowl. Whisk well to combine; set aside. 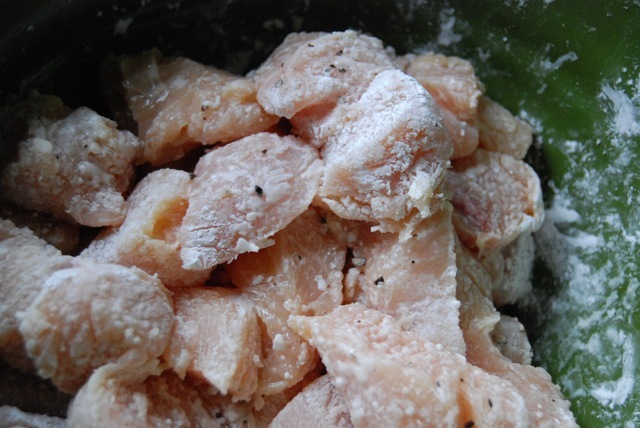 Place the chicken pieces into a large bowl, add the 1/4 c. cornstarch & freshly ground black pepper to taste and toss well to coat (use tongs, it gets messy). Heat 3 T. vegetable oil in a large heavy-duty skillet over medium-high heat. Once hot, add the chicken and cook, flipping after 2 minutes, until it’s lightly browned on two sides, roughly 4-5 minutes. Add the remaining tablespoon vegetable oil to the skillet. Add the desired amount of red pepper flakes, ginger and whites of the scallions and cook, stirring, 1 minute. 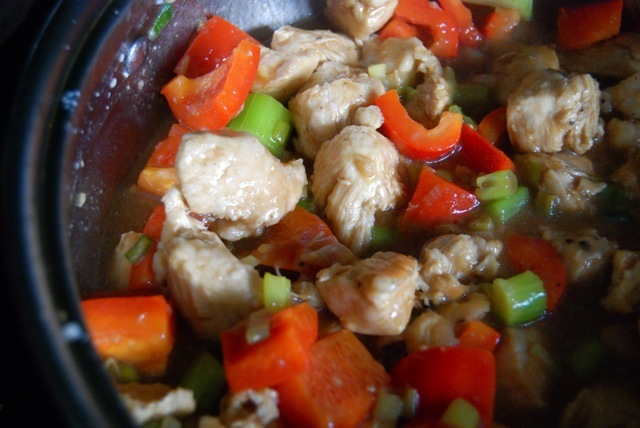 Add the red bell pepper and celery and cook, stirring, until they soften slightly, about 2 minutes. Add the rice vinegar and cook until it almost completely reduces, 30 seconds to a minute, scraping the bottom of the pan to incorporate any browned bits. Give the chicken broth mixture a quick whisk, then add to the pan. The sauce should immediately thicken. 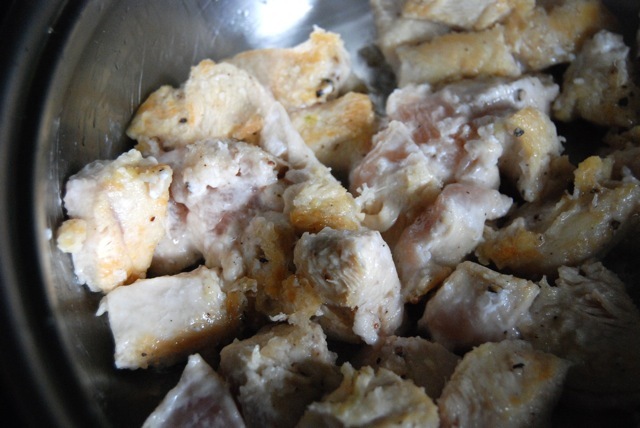 Slice into one of the thicker pieces of chicken to see if it’s cooked through. If still pink, reduce heat and cook a couple minutes more. Remove pan from heat and serve immediately, ­sprinkled with the chopped nuts and scallion greens. Looks beautiful! A picture like that last one could make the biggest veggie-phobe want to dive in, I think. Maybe even Tracey’s husband, who claims he’s “allergic”. Psh! ‘Kung Pao’ is almost too much fun to say. I like to repeat it several times daily. In a context that makes no sense what-so-ever. I KNOW! KUNG PAO! right in the kisser! Almost as fun as my personal fave – SHA-ZAM! I love Kung Pao chicken. I’ll definitely have to try this recipe.I know what you mean about missing Chinese food. Shambo, I hope you enjoy it as much as we did. 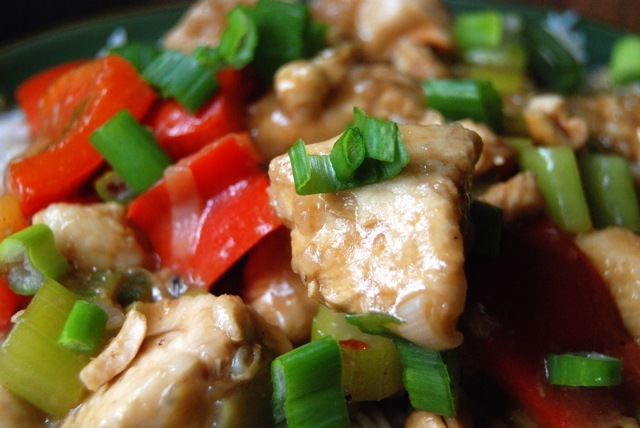 I am going to try it next time with baked, cubed tofu – though as a meat eater it’s hard to beat chicken! Have a wonderful weekend! It’ll be on the menu this week! 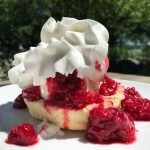 Can hardly wait to take a bite…thanks! You’re so welcome, Cheryl!! Hope you love it! 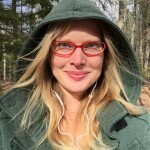 Hi Christy, i’m new to your site and am so happy to have found you!! I wanted to tell you that i recenlty made a beef and brocelli stir fry and found a great lower sodium soy product called Bragg’s Liquid Amino’s. It contains 320 mg of sodium per teaspoon. So still some salt, but way less then the regular and reduced sodium products on the market. The best part is, its just as good as the regularly salted soy sauce! Hi Marcia – sorry for my slow response! Welcome to The Daily Dish & thanks so much for your comment. I too love Braggs Liquid Aminos and often use it in lieu of soy sauce when only a smidgen is needed. Great taste and so healthy! I made this recipe tonight – it rocked!!!! Thanks! Awesome, Andrea!!! So glad to share! 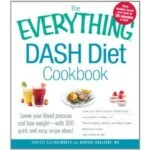 My adventures in low sodium cooking are just that, a continuous adventure thanks to your fantastic website! Thank you seems inadequate but I say it with sincerest gratitude. These recipies ( and your inspiring story) have been a huge part of guiding me out of a very dark season of my life to one of strength and hope.